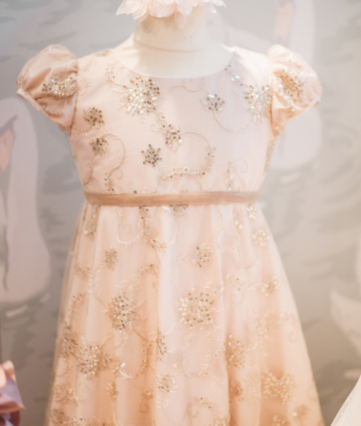 We recently attended White Gallery where we launched the new 2014/15 collection of flower girl dresses to our wonderful UK stockists. We’re pleased to say that the collection went down really well and we even picked up a few new boutiques – all will be revealed soon! Whilst there we met up with the lovely Annabel Beeforth from the number one wedding blog ‘Love My Dress’ and we were thrilled when she wrote this lovely review of us…. I adore designer Nicki Macfarlane – she who created the beautiful little flowergirl dresses for Kate and William’s Royal wedding. Nicki is such a lovely person – warm, welcoming, full of excitement to tell you about her beautiful designs, which speak for themselves. They are the epitome of flowergirl charm and elegance, with the added bonus of being expertly crafted. The sparkly sequin creations are sure to be popular with lucky little flower girls all over the land”. This entry was posted in Events & Shows, Interviews & Features, Product Spotlight. Bookmark the permalink.